Reconditioned 10 lb CO2 cylinder in steel with CGA320 valve installed. 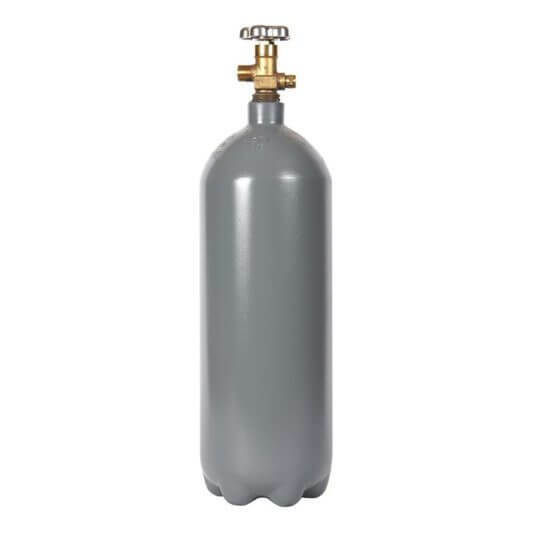 Traditional-sized, mid-capacity carbon dioxide cylinder provides reliable performance and great wholesale value in a versatile package for multiple uses. We recondition all cylinders to an exacting standard, including full hydro testing and exteriors finished in new, durable, rust-resistant paint. Our reconditioned tanks were originally made by multiple different manufacturers. The reconditioned 10 lb CO2 cylinder dimensions listed here are typical for the cylinder size. The product may vary by +/- several inches in height and some distance in diameter. Cylinder bottom may be flat or bottle-style with flanges.